Finally Ainol has released the long waited NOVO 10 Captain English edition. However, the hardware spec is not the same as the original one published in Oct. 2012. Three major upgrades: OS is upgraded from Android 4 .1 to Android 4 .2 Jelly Bean, memory is upgraded from 1GB to 2GB, the battery is upgraded from 10,000 mAh to 11,000 mAh. Two major downgrades: GPS is removed and the screen resolution is down from 1920 x 1200 to 1280 x 800. Considering those changes, we have reduced the sale price from $259 to $229. We of course still honor all pre-orders ($219), but if you decide to cancel your pre-order because of the spec change, we fully understand, just let us know. 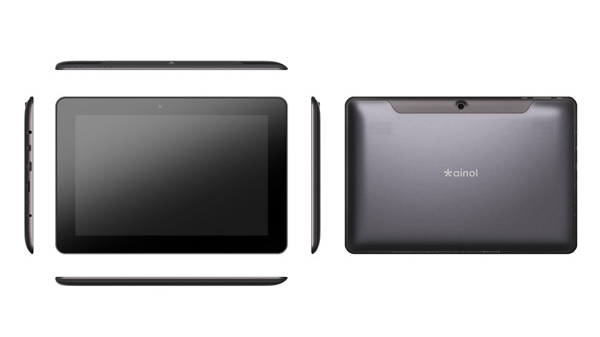 Ainol NOVO 10 Captain uses a 1280×800 pixel 180 degree viewing angle IPS capacitive screen made by LG and runs Google’s latest Android 4 .2 Jelly Bean (the same OS on Google Nexus 7 ). NOVO 10 Captain is powered by a 1.5GHz ACT-ATM7029 ARM 2nd generation Cortex-A9 based quad-core CPU with built-in dual-core GC 1000. The RAM is 2GB super fast DDR 3. It has dual-cameras – 0.3MP front facing webcam and 2MP rear facing camera. NOVO 10 Captain has HDMI port so that you can play video and games on your big screen HD TV. Ainol NOVO 10 Captain has Google Play (Android Market) pre-installed. It supports bluetooth 2.1, so you can connect it with bluetooth keyboard (like our uPlay wireless keyboard case ) and bluetooth game controller. Ainol NOVO 10 Captain has a supper large 11000 mAh battery, so you can enjoy playing game or surfing web for 10 hours without charge. We are receiving Captain from Ainol factory, and will ship out all pre-orders soon after.